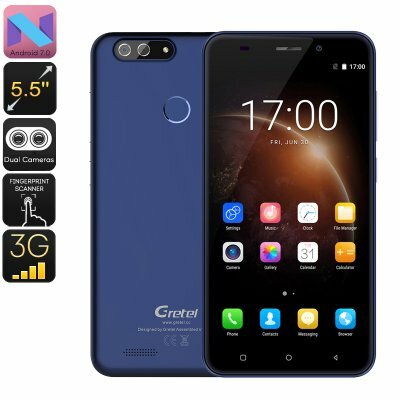 Successfully Added HK Warehouse Gretel S55 Android Phone - Android 7.0, 2600mAh, Quad-Core CPU, 5.5 Inch, 3G, Fingerprint, Dual-Rear Camera (Blue) to your Shopping Cart. The Gretel S55 is an affordable Android phone that comes with a powerful 2600mAh battery. This cell lets you enjoy all the latest Android features for up to 10 hours in a row. Additionally, it brings forth 4 days’ worth of standby time. You will be able to use this cheap Android phone through multiple days of regular smartphone usage without needing to worry about running out of juice. It runs on the Android 7.0 operating system. This means that it will treat you to a smooth user experience while enjoying the latest software applications. On the 5.5-Inch HD display of this Android phone, you’ll be able to experience great visuals. With IPS technology, it treats you to stunning details and vivid colors no matter your viewing angle. This makes your Android smartphone great for playing games and watching movies. With its Quad-Core CPU clocked at 1.3GHz, this cell phone can handle all the basic media and Android games out there. It supports 16GB internal storage and a 32GB SD card slot. This provides you with plenty of storage for all your files and media. Dual-IMEI numbers bring along great connectivity. With this Android phone, you can always stay connected to two network providers at the same time. With 3G, it lets you browse the web virtually anywhere you’re at. From now on, you’ll be able to stay connected to friends and family even when you’re traveling abroad. At the same time, it lets you shoot stunning pictures of all your upcoming adventures thanks to its dual rear camera. With the Gretel S55 Android phone at your side, not a single moment will pass by without you snapping the perfect picture.